(Nanowerk News) Jupiter's trademark Great Red Spot — a swirling storm feature larger than Earth — is shrinking. This downsizing, which is changing the shape of the spot from an oval into a circle, has been known about since the 1930s, but now these striking new NASA/ESA Hubble Space Telescope images capture the spot at a smaller size than ever before. Jupiter's Great Red Spot is a churning anticyclonic storm . It shows up in images of the giant planet as a conspicuous deep red eye embedded in swirling layers of pale yellow, orange and white. Winds inside this Jovian storm rage at immense speeds, reaching several hundreds of kilometres per hour. This full-disc image of Jupiter was taken on 21 April 2014 with Hubble's Wide Field Camera 3 (WFC3). The Great Red Spot is a high-pressure anticyclone. It rotates in an anti-clockwise direction in Jupiter's southern hemisphere. 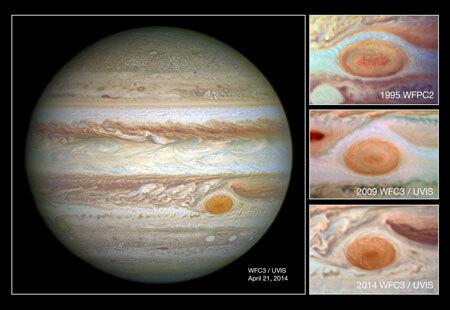 The Great Red Spot itself may have been mentioned in writings before the late 1800s. There are references to Jupiter's "permanent spot" dating back as far as the late 1600s, although some astronomers disagree that the permanent spot mentioned is the Great Red Spot.